For decades, the Honorable Holy Master Ziguang Shang Shi, who founded a large center of Esoteric Buddhism in America, has devoted himself to the noble mission of promoting human health, world peace, and religious harmony. What concerns Holy Master most is how to attain a healthy and happy life as a human being. The answer is “One Day Zen”. Practitioners have proven that practicing “One Day Zen” can help set people free of illnesses, depression, and pain. In this money-oriented society, the compassionate Holy Master Ziguang Shang Shi gives the priceless treasure of “One Day Zen” to those in need for free. People can attain the ability to combat disease through practicing “One Day Zen”, a form of the Great Perfection Dharma. Learning the historic Esoteric Dharma to relieve suffering, is great news for those who want to increase their physical, mental, or spiritual health. “One Day Zen” class is free and suitable for beginners. ● Increase your current level of mediation. GHMZ Health Hall will become the Happy Zen Center of Amsterdam. 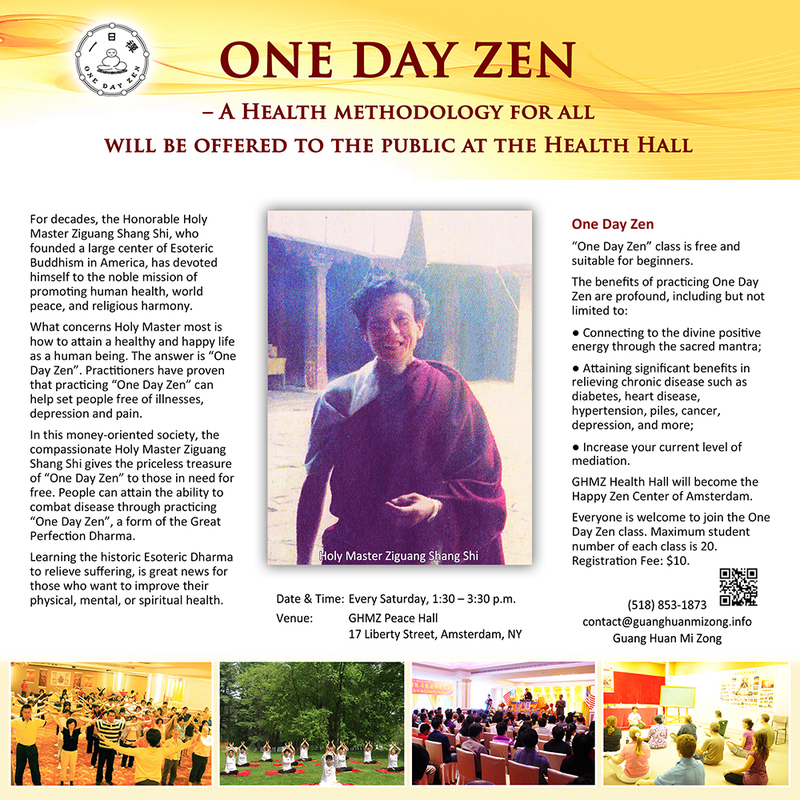 Everyone is welcome to join the One Day Zen class. Maximum student number of each class is 20. Registration Fee: $10.